Dhaka City: Where We Live? We live in our Dhaka city but sometimes it is very mieasurable to see Where we live.There are many place in our city where is not safety to live. 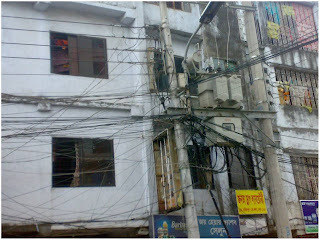 The constaction is so poor and the living condition is very risky. The electrict line so conjusted and there is no place for adequeate electrict line. sometimes it is very close to our house, that can make dieaster any time. In this picture we are seeing this kind of picture. Try to find your own way. do not bother about your caliber. just start from the end, that you finished......you have sky limit opportunity..